- Fixed Holy Word: Serenity not being trackable in the Custom Cooldown module (ticket #232). - Fixed "0" showing up for some users after 1.10.13 by adding a "show when zero" checkbox to custom counters (disabled by default). Anyone who has used IceHUD for a very long time has automatically-converted custom counter modules that replaced the old "maelstrom", "lacerate", and "sunder" modules that used to exist, each of which exhibited the behavior after the last update. - Fixed alpha settings for spell charges on custom counter bars and stack counters to treat "full" the same way a Mana or Health bar would. Previously these treated "full" as "empty" for charges because that's how buff/debuff stacking should work (ticket #231). - Fixed custom counters in numeric mode not hiding the count properly. - Updated default text values for Health and Mana modules to show values in shortened form so they're more readable. Anyone who has customized their text will not be affected by this change and the shortened form only kicks in once values reach 10,000. - Fixed the old energy ticker showing up in 7.1. - Re-enabled PlayerAbsorb by default by popular demand. - Added support for the Scale setting on mirror bars and extended the mod-wide scale setting to a range of 20%-200% (ticket #228). - Fixed Runes module causing a memory leak. - Added a toggle to cause Runes to display the same way as combo points: show a series of icons that empty and fill back up based on the number of runes available. - Added a toggle to cause Runes to display as just a number of available runes. - Added an option to keep Runes displayed on the screen whether you have a target or not if not all runes are recharged. 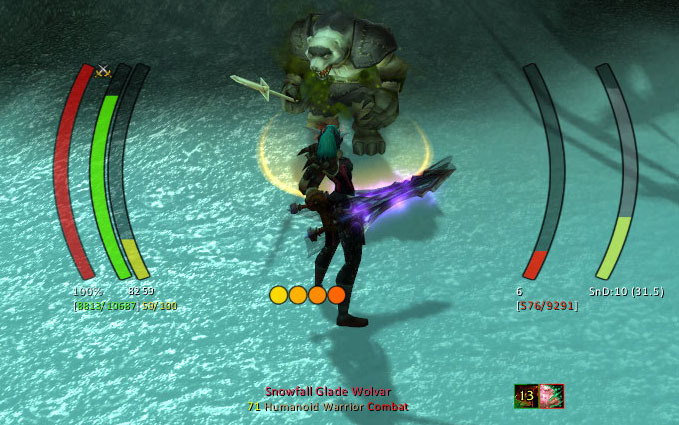 - Added display of the player's current absorb amount to the top of the health bar. Incoming heals display on top of both. Disabled PlayerAbsorb by default because of this addition. - Fixed combo points sometimes showing a max of 5 when it should show a max of 6. - Added coloration to the Roll The Bones module for how many RtB buffs the player has active (ticket #227, thanks Zahariel!). - Added an option to PlayerMana to allow scaled mana color gradients to be used on classes that don't use Mana. - Added a user-submitted Roll The Bones module (ticket #220, thanks Zahariel!). - Fixed error on startup in 7.0 for users with old MaelstromCount, SunderCount, or LacerateCount modules in their settings. - Fixed reliability of visibility of the Absorb modules. They were sometimes showing up when they shouldn't and could be slow (or fail) to actually display when they needed to. -- Accounted for all 7.0 API changes such as UnitIsTapped, UNIT_COMBO_POINTS event, etc. - Updated the Stagger bar with the new Stagger support in DogTags so we don't have to figure out and format values ourselves. - Fixed GCD bar appearing on top of other UI elements incorrectly - it now appears at the same level as the rest of the bars. - Fixed lag indicator on cast bars when they were set to "reverse" - the lag indicator would appear at the wrong end of the bar. - Fixed the Resolve module to work properly (thanks cgsg11!). - Fixed an error popping up about missing localization in the CustomCounterBar. - Added optional aura icon to the CustomCounterBar by request. - Added a custom counter bar module by popular demand. Behaves exactly like a stack counter module, but in bar form. - Fixed a bug causing buff/debuff watchers to not display for (de)buffs that didn't stack. - Made Death Knight rune module cooldown wipes match the shape of the runes. - Fixed possible divide-by-zero in the custom counter module. - Added support for tracking spell stacks and charges in the Custom Count module. - Added Paladin Fist of Justice stun to the CC list by request. - Added Resolve module contributed by darkuja_9 and tweaked a bit. - Added feature to turn burning embers green if the player has the codex of xerrath spell. - Changed bar low threshold step from 5% increments to 1% increments by request. - Added Stagger module from user pilonog. - Updated the Chi module (HarmonyPower) to be able to display 6 Chi. - Fixed a bug where Monks with more than 4 Chi would not draw the additional Chi properly on initial load into the world. - Fixed being able to cancel a buff from the PlayerInfo module when the frame's alpha was zero. Unfortunately the mouse click is still eaten, but at least your buffs don't pop off. - Worked around a bug Blizzard created in 6.0 with cooldown wipes not updating alpha with their parent frame, specifically for Info modules. See http://www.wowinterface.com/forums/showthread.php?t=49950 for discussion. - Updated FAQ in the mod's config panel. - Fixed ComboPointsBar not setting the proper alpha value sometimes. - Inactive mode "Darkened" on class power counters now displays a darkened background behind a full/partially full rune as well as the old behavior of showing empty runes as darkened forms. This aids in class powers like Demonology Warlocks who need to be able to see the full bar. - Fixed "divide by zero" errors that could happen in class power counters when switching specs. - Fixed Hide Blizzard Frame option not properly hiding and showing all Warlock Power built-in frames for all specs. - Info modules now display a random stack count from 1 to 5 when in configuration mode for easier Stack Font Size configuring. - Fixed error generated by configuration mode with a CC module enabled. - Added support for ComboPoints, ComboPointsBar, and SliceAndDice to display with no target selected. - Fixed Vengeance- and Sunder-related 6.0 errors. - Fixed a few more errors popping up for specific classes with specific modules setup. - Fixed a bug with custom cooldown bars that existed prior to v1.9 causing errors when opening the configuration screen. - Fixed a localization-related issue causing an error for all locales. - WoW 6.0 TOC and compatibility updates. Rogue combo points will only be displayed when targeting an enemy for now until Blizzard adds an API to get combo points without a target. - Fixed CustomCDBar not displaying correctly in 6.0 when in "When ready" mode. - Fixed bug with the player's mana bar not updating its alpha properly when entering the world (i.e. teleporting/hearthing/etc.). - Fixed a bug causing combo points to always display in Numeric mode for any class instead of hiding when the player has 0 combo points and 0 anticipation stacks. - Possibly fixed some NaN/divide-by-zero errors that have been cropping up sporadically lately. - Fixed a bug where buff/debuff watchers were not removing themselves from the central Update list when deleted. - Fixed an issue causing cooldown bars set to "when ready" to not display if the player had no target but the spell was castable on the player and ready to be cast. - Packaged latest version of LibDogTag for some memory and performance improvements (should reduce "script ran too long" errors). - Added 90 degree rotation as an option for mirror bars. - Added support for DogTag strings on buff/debuff watchers. - The "Dismiss" option in pet right-click menus is no longer disabled for Warlocks. - Removed extremely old pop-up messages on startup that were appearing for new users. - Ticket #173: added a toggle to hide the entire HUD during pet battles. - Added a toggle to only show cooldown modules when you have a target selected for abilities that don't require a target to cast, by request. - Added Absorb modules for focus, target, and player. - Added Monks as eligible "tank" classes for the Vengeance module. - http://www.wowace.com/addons/ice-hud/tickets/145-hunter-pet-dismiss-error/ blacklisted the "dismiss pet" menu entry in pet right-click menus. Hunters should use the Dismiss Pet spell instead. - fixed PVP icon showing up as a green square for Pandaren who have not yet chosen a faction. this fix applies to TargetHealth and PlayerHealth, but not to DogTag text such as on the TargetInfo frame. - ticket #161: integrated Zahariel's fix for gradients. - removed level restriction on harmony power since apparently that's not a thing any more. - fixed the fifth chi not always drawing immediately when changing specs to one that grants an additional chi. - fixed the numeric display mode for class power counters sometimes showing "..."
- added support for showing the numeric value on top of a class power's graphical display. this number can also be moved vertically. - fixed a few 5.0-related errors appearing in the Threat, CC, and invuln modules. - updated to accept either a spell id or a spell name for custom bars. this allows tracking of different debuffs with the same name (such as Hemorrhage and its DoT). thanks to Nibelheim on WoWInterface for this one as well. - fixed markers stuck in inverted mode. - fixed combining expanding & reverse fill options causing bars to position incorrectly. - enabled the "expand" bar fill for the PlayerHealth & SliceAndDice modules. - enabled bar rotation for the CastBar and Eclipse modules. - added support for rotated markers. - most modules now support a new bar filling mode: expanding outwards from the middle. - super temp hax to make the custom cd bar work with "Holy Word: Aspire"
- made several changes to how mouse interaction works with various modules to support new Clique changes available in its latest alpha version. once a new release of Clique is made, then the Info modules not being click-through will be fixed if the user doesn't want mouse interaction to work there. - added a "second highest threat" overlay to the Threat module that shows where the next-closest person is on the threat bar (in terms of their raw threat value divided by yours) if you're the current tank. - added an option that allows a custom bar to track a substring or full name at the user's discretion. previously it was always a substring match. this was causing a custom bar for "trauma" to also trigger for "mind trauma", for example. - possibly fix weird issue where GetClassColor could be called with a function argument from somewhere...I can't reproduce the error, but several people have reported it, so this ought to fix it. - user-submitted change care of JX: Added "Display when ready" option to Custom Cooldown bar to replace "Display when empty" toggle. - added a feature to display a different cast bar color (red by default) if a target's spell is non-interruptible. took implementation from blizzard frames (including mid-cast event hook). enabled by default. - Added an option to PlayerHealth, to disable party frame even when not in raid. - added user-submitted custom cooldown tracker module. thanks regmellon! - fixed an issue with buff filtering not working properly for looking at buffs only cast by the player. - made the threat module use raw threat percentages by default so that its display matches Omen's. - fixed a bug that caused the /icehud slash command to not work when the addon was disabled (and therefore be unable to re-enable it). ouch! - interface version up to 3.0! hooray new stuff. - general cleanup, removing unused libs, etc. - Worked around a Blizzard bug introduced by the new system that allows the player to see his power (mana/energy/runic power) updating in "real-time" (they call it predicted power). The events for mana/runic power/energy/etc. regen are no longer being fired and the client uses a more cpu-expensive method of updating the available amount of power. Mimicked this new method (which the default UI uses) in IceHUD. - Updated Ace2 libraries to work with the latest beta build. No other changes in IceHUD functionality. - updated targetinfo dogtag to display the word "Combat" when in combat instead of "True"